Everywhere you look everything’s ‘going green’. And for good reason. Consulting firm McKinsey, recently reported that sustainability is now a top strategic priority for almost 50% of CEOs due to its reputation enhancing abilities and alignment with company values or goals. So it’s no wonder that sustainability is increasingly a big buzz in the events market. But how can event managers stay within budget and still be sustainable? Active Air Rentals director Brad Sweeny explains five ways to make your event power and air conditioning more sustainable without blowing your budget. ‘Firstly, engage your suppliers from the outset. By doing this you ensure sustainability is built into the entire plan and costly rework is avoided. Site layouts, types of structures and equipment loads have a major impact on how sustainable your event power and air conditioning can be. By working in collaboration from the beginning you ensure the optimal, most efficient and sustainable use of equipment. Secondly, power is a major sustainability factor. So there are two key things to keep in mind – mains power and biodiesel. Mains power is really important to use, especially if you’re running refrigeration equipment 24/7. This is a trick for young players so make sure you factor it in. If refrigerators need to run over night make allowance for them to be switched from generator power to mains power. This allows you to turn off the generators; and using even a small amount of mains power can drastically reduce your event’s carbon footprint. Also if you choose to use biodiesel for power generators there are a few things to keep in mind. Biodiesel comes from all over the world, and its origin has a big impact on your event’s sustainability. The most sustainable biodiesel is made from recycled vegetable oil and animal fats while the least sustainable is made from purpose-processed vegetation and animal fats. Additionally, biodiesel burns at a higher rate so biodiesel generators use more fuel than standard generators. This will cost more and be less sustainable if a low-grade biodiesel is used. Make sure you ask your supplier about their biodiesel origins. Thirdly, focus on power distribution – this is how power is distributed from central points like mains or generators to end equipment, such as air conditioners, audio/visual equipment, power boards for plugs etc. Simple changes to how power is distributed across an event site can have a large impact on an event’s sustainability. Your supplier will be able to specify the most sustainable power distribution options that ensure optimal power with minimal environmental impact. Fourthly, ensure a more sustainable event by optimising your air conditioner use. There are four areas to think about – environment (structure and location), scheduling, capacity and ducting. The type of temporary structure you use makes a big difference. A clear-sided marquee in full sun with no shade will require a lot more air conditioning (and therefore be more costly and less sustainable) than a strategically shaded temporary structure that has clear-sides only where needed. Scheduling events earlier in the day also reduces heat load thereby reducing the amount of required air conditioning. Also, don’t be fooled into using minimum-specified air conditioners to save money. You’ll end up paying more in power costs. This is because slightly over-specified air conditioners have the capacity to adjust their output depending on temperature requirements. Over a whole day slightly over-specified air conditioners are more energy efficient than under-specified air conditioners running at maximum capacity. So if you optimise the air conditioner you instantly optimise power use – reducing costs and increasing your event’s sustainability. Ducting is how air-conditioned air is moved around a structure. Wall panel ducts and spot air conditioners cool localised areas, where as packaged unit air conditioners connected to fabric ducting runs, cool entire structures. Your supplier will be able to specify the most sustainable combination of air conditioner and ducting to ensure optimal cooling with minimal environmental impact. ‘The Active Air Rentals team are very professional and accommodating. Nothing is a problem and they go above and beyond what is required. They always make sure it all runs smoothly.’ – Kain Jones, Special Project Manager, TDC. 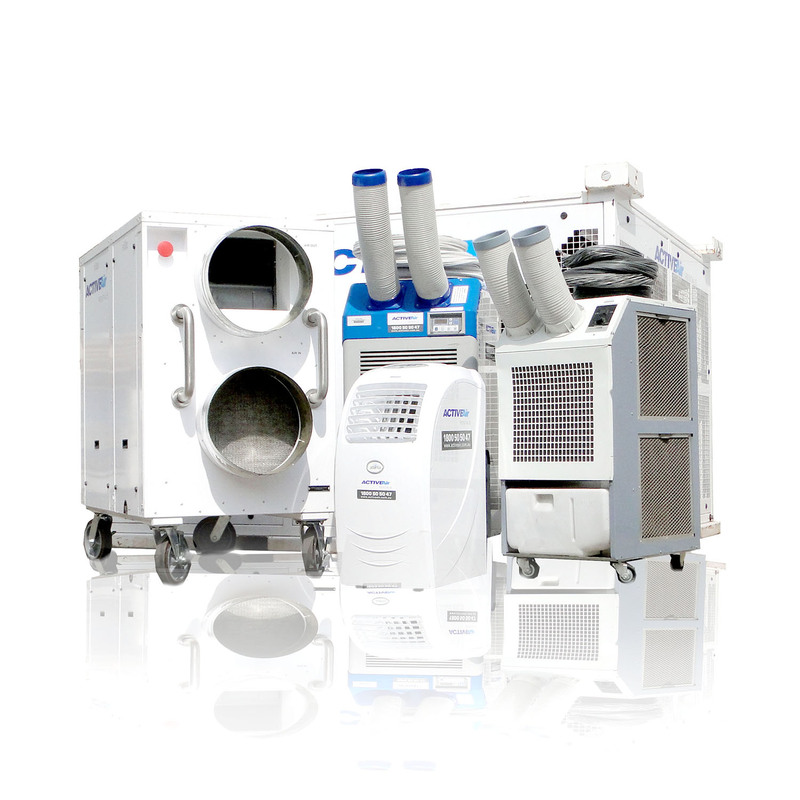 Active Air Rentals is Australia’s leading sustainable temporary power and air conditioning rental company. Some of our biggest event clients include The Australian Open, Masterchef, Taste Of Sydney, Taste Of Melbourne and more. Today we are a multi-faceted business with four branches, two distribution centres and employing over forty permanent staff across Australia.